File There is not an upload file. 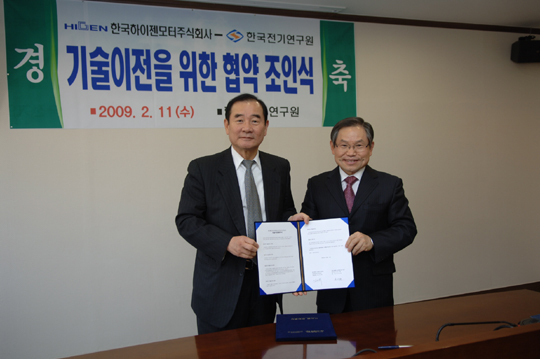 On February 11, 2009, HIGEN MOTOR signed a technology agreement with KERI (Korea Elelctrotechnology Research Institute, www.keri.re.kr) to develop and market transverse flux motors for rotary motion applications. 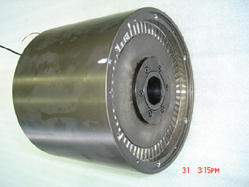 Only a handful number of companies in the world have technologies to produce transverse flux motors today. Having been spun off from OTIS Elevator as an independent company on January 1, 2008, HIGEN MOTOR specializes in motor businesses and is actively pursuing top notch technology to find energy efficient and environment friendly power transfer solution to its customers in the global market. HIGEN MOTOR Co., Ltd and Korea Electrotechnology Research Institute(KERI) signed an agreement on Transverse Flux Rotor technology on February 11, 2009. Followings are general characteristics of the technology. 1. High torque with a smaller size. Gear reducers are not necessary for power transfer. Machine tools, automatic doors, manned / automatic guided vehicles, wind power, etc., where high torques at a low speed and small sizes are necessary. Mr. TAE-HWAN LYU, President of KERI, a government R&D institute, and Mr. JaeHak KIM, CEO of HIGEN MOTOR attended the singing ceremony held at the main office of KERI on Feburary 11 at Changwon City of Korea. (PHOTO 1) . According to Dr. Do-Hyeon Kang of KERI, “So far most of rotors are longitudinal flux type, but with this new technology transverse flux motors are going to be commercialized”, he emphasized. “In the future, there are plans to expand the technology to cover large capacity motors and generators such as the propulsion motors for marine vessels, wind generators, etc. This technology is registered for patents with government authorities in Korea, USA, Japan, and EU. 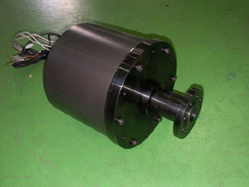 In Korea, linear motion type of Transverse Flux Motor technology has been already successfully commercialized in electronic and LCD industries. And yet, the rotary motion type has not been developed so far and HIGEN MOTOR has taken a pioneering role to develop and commercialize this technology for Korean market and for the global market eventually.